I have to admit Magneto wasn’t the figure I was going for when I picked him. I was trying for Silver Surfer. I didn’t realize Magneto had a cape and thought it was the surf board. Magneto is one of those characters I’ve never quite understood the look of. Sometimes he’s really ripped and sometimes he’s not. I’ve always had the impression that he was more of a thinker than fighter. In most cases, he uses his mutant power before anybody can even get close to him. I’m assuming due to generic body use, we ended up with the ripped version of Magneto here. It’s okay, he has looked that way in the comics. The body here is really generic as the only details added are the stripes at the wrists and ankles. 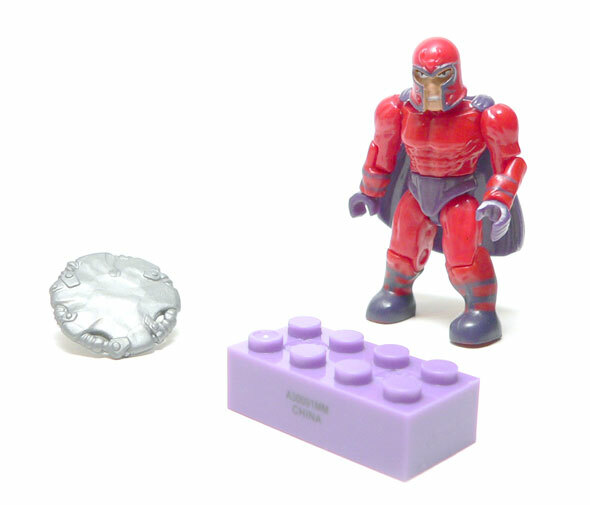 There are two pieces that set this figure apart as Magneto. His head and a cape. This head is in the more cartoon camp of the Mega Bloks figures. It’s okay. The little face underneath looks a bit angry. It’s not the worst I’ve seen, but far from the best. 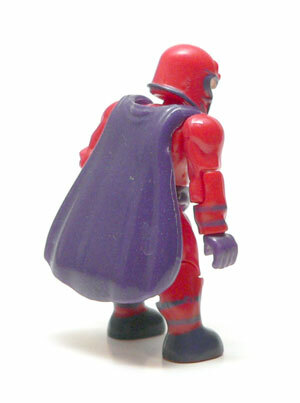 The cape looks a bit like a sack of toys slung over his back with the rounded bottom. 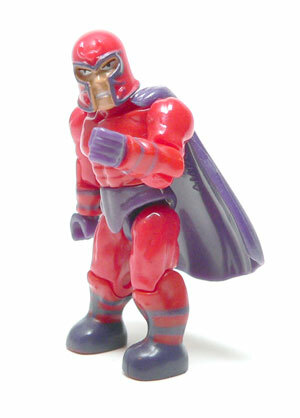 It does have the opening at the top around the neck that Magneto seems to prefer over one that is tight to the neck. Without a bunch of twisted metal around him, how much fun can Magneto really be? He does come with the same shield we’ve seen before, this time molded in silver to give it the metal look. Whoopie! A metal shield. How’s he suppose to wreak mutant mayhem on my other figures with that? I’m not disappointed I got a Magneto. He’s a bad guy, and a pretty key one. The execution isn’t bad. He’s just not that exciting of a figure. If he’d came with a piece of twisted metal or something, I’d have rated him much higher. The pastel purple block is what really put me over the edge on this one. Couldn’t it have at least been gray or silver? I actually wish they were all black. They you could make something with them. Or at least all the same color. 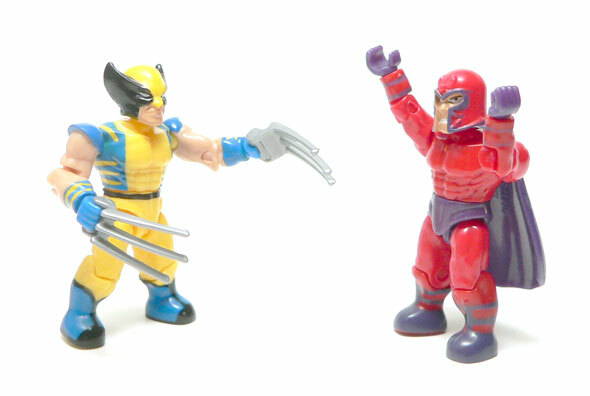 I actually like these figures, although to be honest I do think Magneto is not the most interesting character in the series. I don’ t mind him as much, since I have Wolverine to pair him up against.